New Delhi, India (Reuters): India and China have agreed to an “expeditious disengagement” of troops at a disputed border area where their soldiers have been locked in stand-off for more than two months, the South Asian nation’s foreign ministry said on Monday. The decision comes ahead of a summit of the BRICS nations - a grouping that also includes Brazil, Russia and South Africa - in China early next month, which Indian Prime Minister Narendra Modi is expected to attend. “In recent weeks, India and China have maintained diplomatic communication in respect of the incident at Doklam,” India’s ministry of external affairs said, referring to the area in the Himalayas close to the borders of China, India and Bhutan. 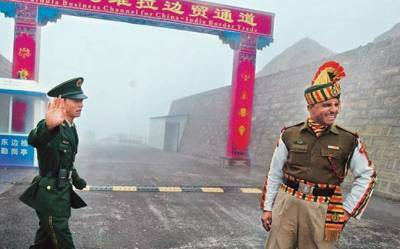 Chinese and Indian troops have been confronting each other close to a valley controlled by China that separates India from its close ally, Bhutan, and gives China access to the so-called Chicken’s Neck, a thin strip of land linking India and its remote northeastern regions. New Delhi says the dispute erupted after India objected to the Chinese building a road through the mountainous area. Small incursions and troop stand-offs are common along other parts of the contested 3,500-km (2,175-mile) frontier, but the recent impasse was marked by its length and the failure of talks to resolve the dispute, raising fears of a wider escalation as the two Asian giants compete for influence. The Nathu La Pass on the frontier between the Indian state of Sikkim and Chinese-controlled Tibet, was the site of a fierce border clash between Chinese and Indian troops in 1967.